The Emerging Markets (EEM) reached new highs in January… but saw new lows in February, June, July, and August. On to September and an update below. The EM space has been a major laggard, getting hit by a combination of the US Dollar, debt concerns, and local currency concerns. Those concerns continue to linger, as investor confidence wavers with the Turkish lira and economy (debt). 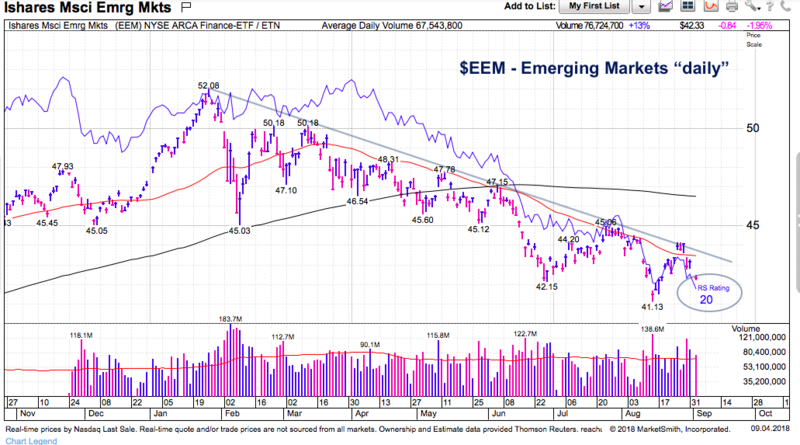 And the popular ETF (EEM) remains in a downtrend. 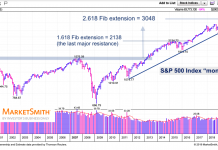 Below are several MarketSmith charts built with Investors Business Daily’s product suite. Their services make it easy to sort by strongest stocks, industries, and types (growth vs value). I use them for charting, data sorts, and comparative analysis. 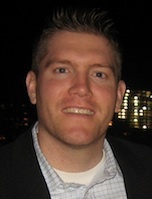 I’m also an Investors Business Daily (IBD) partner – you can gain access here. 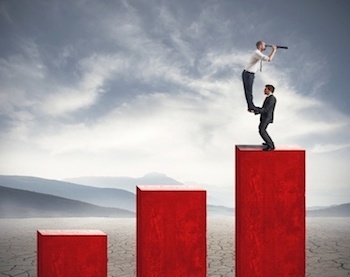 The charts below offer a high level looks at the “trend” and discuss why it’s wise to remain patient… waiting for a trigger. Price is in a clear downtrend. 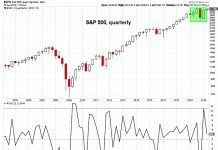 It’s getting oversold and one of these rallies will eventually stick. 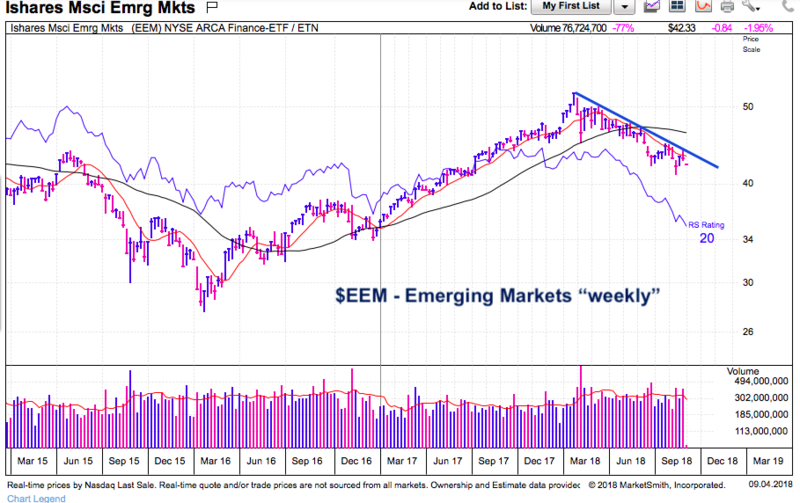 A few See It Market contributors highlighted the recent short-term trading opportunity in Emerging Markets (Mark Arbeter / Chris Kimble). The rally grabbed +6% but would prove fleeting as EEM could not hold above the 50 moving average. Again, we are in a downtrend. We can see the upper resistance line marking the lower highs for the past several months. 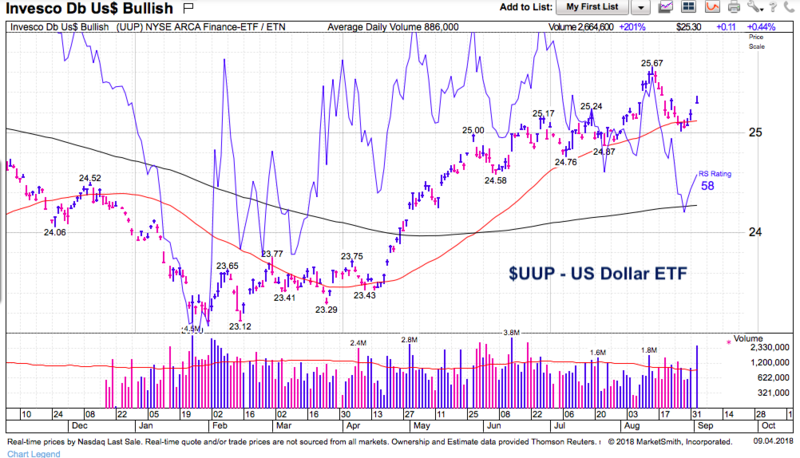 The US dollar (UUP) has not helped the emerging markets cause. It’s pulled in a bit, but in general has shown strength over the past four months. 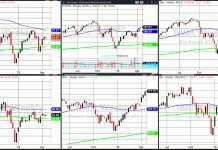 Though the most oversold tend to see the sharpest bounces, timing can be difficult… and the chart setups need construction before they can start a new uptrend. 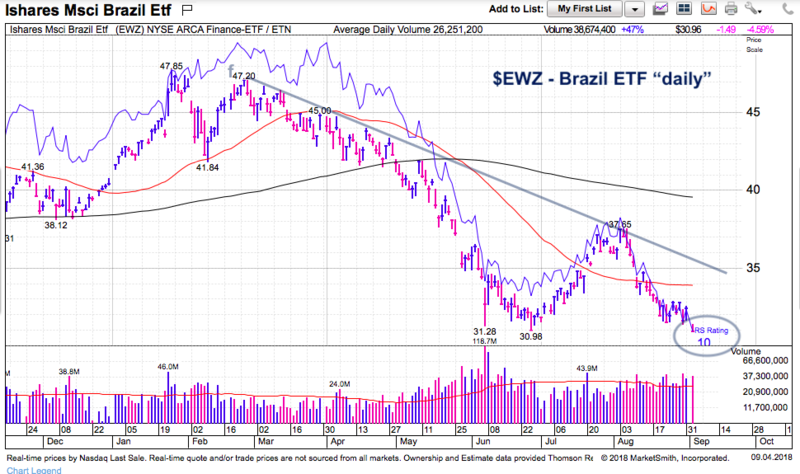 Brazil (EWZ) is at the lows and lagging. Not great, but holding on. India (INDA) is well off its recent lows… but also well off its January highs. Nonetheless, it’s hanging in there. 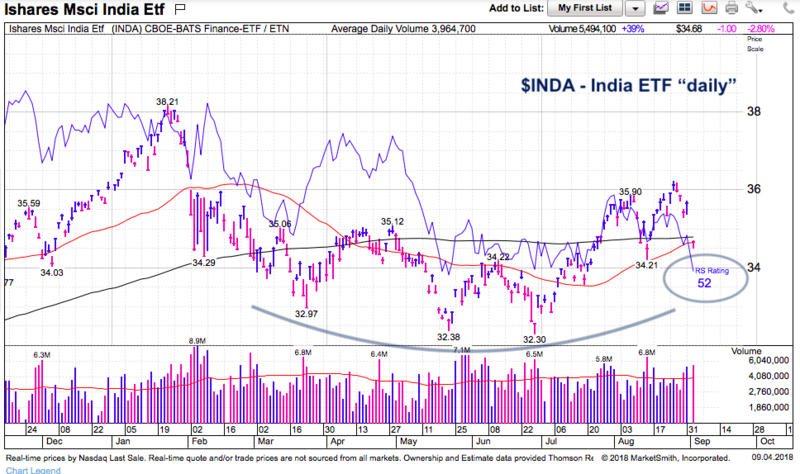 Perhaps a successful retest where buyers defend INDA would set the stage for a real Emerging Markets rally… something to watch, but that hasn’t happened yet.